Paul: [the Monsignor is asking Paul about his church affiliation] I don't go to church, sir. Monsignor Ernest Mueller: [Surprised] You don't go to church? Monsignor Ernest Mueller: You're not a Protestant, are you? Monsignor Ernest Mueller: Thank heaven for that! Paul: [a bit hesitant] I am an atheist, sir. Monsignor Ernest Mueller: [Taken aback] I beg your pardon? Paul: I'm an atheist, sir. Monsignor Ernest Mueller: You mean you deny the existence of God? Q: Is 'Dracula Has Risen from the Grave' based on a book? Q: How could Dracula enter Maria's bedroom uninvited? Q: Who killed the girl in the bell in the beginning scene? Great Gothic Hammer horror. One of the better Dracula sequels and one of director Freddie Francis' best. It has a lot of the elements you expect and appreciate from Hammer: solid actors, great sets, quality direction, beautiful and vivacious young women. 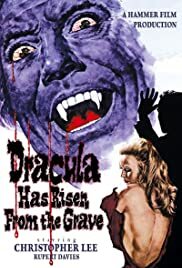 The plot is relatively simple: Dracula wants revenge and pretty blonde Veronica Carlson but her Monsignor uncle and loser boyfriend have a thing or two to say about that. There's also some interesting additions to the mythology where belief vs atheism is concerned. It all makes for a very entertaining sequel full of many familiar and proved effective Hammer staples, with several new ones as well.